Description: Allan Quartermain is hired by a woman looking for her father who disappeared under strange circumstances. I believe myself to be a relatively calm person. I have calmly sat through many movies, good and bad, and not been over-zealous because of the things happening on screen. This movie broke me. Rarely have I witnessed the amounts of utter stupidity happening on screen. This movie had points where I was half-expecting Porky Pig to finish the scene going "T-T-T-That's all folks!". Really, we have Looney-Tunes-amounts of stupid on the screen during this movie, but the fault is that we're still sort of supposed to take it seriously. Quarterman waterskies behind a train, pole-jumps a lake of lava and they even put in the stereotypical cannibals with the giant pot, complete with a carrot joke. I mean, wow! Speaking of stereotypes, if you like laughing at Germans, then is this EVER the movie for you. One of the main villains is a World War I colonel who listens to Wagner, has a silly mustache, is small and chubby and even eats sausages. Wow. In all honesty? Just go watch the Looney Tunes. You'll have a similar experience, only the laughing will be intentional. Okay, so maybe I could be kinder to this movie. I am quite honestly stunned at some of the very beautiful locations they've found for this movie, and while the movie is mostly stupid, it certainly had me sit through the whole thing. If you are to enjoy this movie, best you enjoy it ironically. The cheese factor is very, VERY high. Prepare for action! Prepare for adventure! Prepare for a whole lot of cheesy acting! Richard Chamberlain plays Allan Quatermain, an adventurer who accompanies Jesse (Sharon Stone), the daughter of an archaeologist who claims to have found the location of the legendary King Solomon's Mines, a place of immense wealth. Their journey through the darkest Africa is constantly being hindered by the very stereotypical (in Hollywood terms) German colonel Bockner and the equally evil Turk Dogati (played by John Rhys-Davies), as well as various African tribes trying to eat them or throw them to the crocodiles. 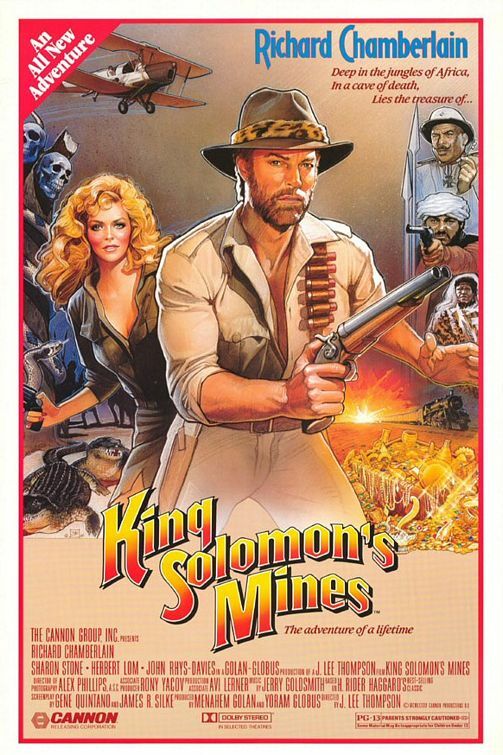 I will go as far as to say that this movie is the poor man's Indiana Jones. Although the books about Allan Quartermain preceded Raiders of the Lost Ark by about a hundred years, it is easy to see that it was trying to cash in on the adventure film genre made popular by the Indiana Jones franchise. Richard Chamberlain as Quatermain. His character is supposed to seem tough at first, only being interested in getting paid to do his job. But Chamberlain quickly sheds this image to play the obvious heroic guy, and delivering an over-the-top performance. One of his most glorious moments is when he fights on top of a moving train, on the side of a moving train, under a moving train, and culminating in him waterskiing behind a moving train. Yes, you read that right. Still, that doesn't exactly top jumping onto a horse from a biplane. Sharon Stone is playing the typical blonde beauty without much of a clue, and even though she does pack a few punches, she is whiny and hysterical, although she doesn't reach the same level as Willie in Indiana Jones and the Temple of Doom. The movie is supposed to take place during the first World War, and so the German army is the main antagonist (out of many) to Quatermain. Although there were no Nazis during this period, Hollywood simply LOVES ze hilarious Nazis, and Colonel Bockner fits every stereotype. Eating sausages and listening to Wagner, carrying a riding crop and just generally being a little fat guy with a temper. Ze German army will not stand for zis, but Hollywood carries on. Dogati (played by John Rhys-Davies) is probably the most likable character in this movie. That is, when the rest of the cast consists of over-played stereotypes trying to be funny. It's interesting to see Rhys-Davies play much of the same role as he did as Sallah in Raiders of the Lost Ark. His Dogati is fearful and he will surprise you more than once in this movie. The movie is supposed to be a light-hearted take on the adventure genre, as well as a parody of Indiana Jones, so if you can switch off your brain and look through fingers with the amounts of cheese in this movie, it is an enjoyably ride.